AAMD Celebrated 50 Years in 2018! In 1968 the Colorado Apartment Association Denver Chapter was formed by a small group of local apartment owners who felt it necessary to protect their interests as small business operators. On March 18, 1968, approximately 75 apartment owners met at the Heart of Denver Motel to discuss organizing an apartment owners association. At the March 25th meeting, Robert Whittlesey was unanimously elected President, Paul Jones as Vice President, A.A. Keith Second Vice President and Neil Richardson as Secretary-Treasurer. The budget was discussed, and it was determined they would need approximately $6,000 per year for operating expenses! The membership dues were a whopping $25 per year (which included NAA Dues) and dinner meetings were held at various restaurants at $4 per person! 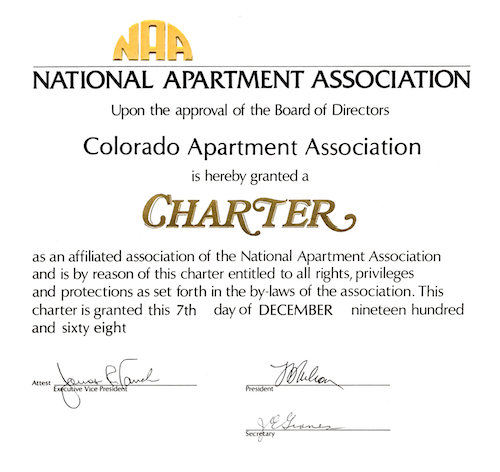 AAMD officially became chartered with the National Apartment Association on December 7, 1968, and a few years later, renamed itself as the Apartment Association of Metro Denver (AAMD), and established itself as a 501 c 6 trade association. Focusing on the principles of free enterprise and providing quality housing for those that choose to rent, the association has through the years held off many legislative issues that would have had negative impacts to our industry. Over the decades the association has continued to develop and enhance the level of professionalism of operating rental housing. Beyond the fundamental role of apartment living advocacy, the association has evolved into a powerful training entity through incredible volunteerism from industry experts. Long time members have continued to brand the organization as AAMD. It didn't take long for the Association to expand its membership to supplier companies. Through enormous opportunities and functions, supplier members have gained access and promotional platforms through AAMD. Providing great financial and volunteer support, the AAMD supplier members have evolved into a great asset of the organization. The mission of the AAMD is to enhance member and association profitability, prosperity and professional growth through legislative representation, educational advancement and networking opportunities. Provide professional networking opportunities among many types of AAMD members. Develop a positive relationship with communities and government and protect association members from intrusive legislation. Provide for public understanding and support of our industry.